Izzy Lane- recently divorced, recently moved back to her childhood home with her child Noah. Izzy is looking for some normalcy in her life- but it’s hard to find. When her ex-husband gets a new girlfriend, it’s so easy to tell the little white lie that she has a new boyfriend. After all, who has never told a white lie? At night- when Izzy blogs behind closed doors- stories of dating, of life after divorce happens and thus “Mac” was born. It’s all harmless fun- till people in her life want to meet this man. Till her best friend’s website adds Izzy as a dating expert. Till Izzy actually meets a real life man who makes her want to leave Mac behind. Can Izzy right this wrong? I read Amy Sue Nathan’s debut, The Glass Wives, some time ago. I remember liking it- but it being a bit more emotional or gritty than I was looking for at the time. 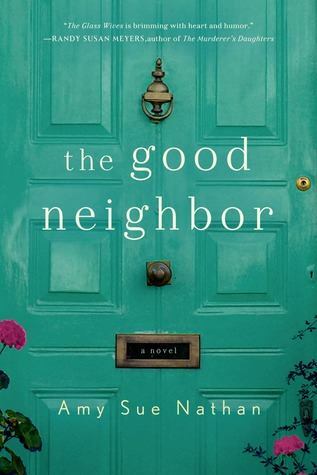 So, when I heard about The Good Neighbor, I was unsure of whether to request it. It sounded light- but….. the choice was made for me when the book showed up in my mailbox. I was sick a couple of weeks ago when I started reading this book. Eager for something funny and light- I picked the book up and began reading. The Good Neighbor and I instantly clicked. I can’t explain why- I just know that I felt so good about this book when I was reading it. This is not to say the book was perfect- because it wasn’t. I kept saying “Izzy! Just break up with Mac. Problem solved.” But, Izzy was not listening to me. I was hoping, hoping, HOPING that the identity of CD was not who I thought it was. I was wrong. But at least Izzy had the last laugh when dealing with CD. Bottom line: The Good Neighbor came into my life right when I needed it. It had humor, an interesting storyline, and something that I can’t quite put my finger on appeal. Give it a try- I think you’ll be pleased! I enjoyed this one too. I found the fall out from the reveal a little over the top, was it really that bad! Yeah she could have easily ditched Mac at any point, but I guess a story had to be told! Yes! That was a bit over the top. I get why she lied in the first place and I guess I understand why she had to pay for her lies- but something was a bit skewed about the dramatics of the situation. This is going to get complicated for Izzy but I hope it ends well!